Decode and return the integer that was encoded using our VLC scheme. Encode an integer using our VLC scheme and return the length in bytes. Get the number of index selectors. Return the selected FTS aux index suffix. 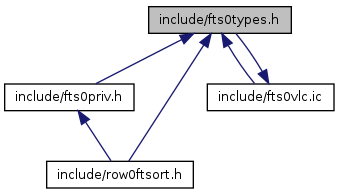 Select the FTS auxiliary index for the given string. Select the FTS auxiliary index for the given character. Select the next FTS auxiliary index for the given character. This function decodes UTF-8 sequences up to 6 bytes (31 bits). On error *ptr will point to the first byte that was not correctly decoded. This will hopefully help in resyncing the input. in/out: pointer to UTF-8 string. The pointer is advanced to the start of the next character. On error *ptr will point to the first byte that was not correctly decoded. This will hopefully help in resyncing the input. UTF8_ERROR if *ptr did not point to a valid UTF-8 sequence, or the Unicode code point. ptr in/out: pointer to UTF-8 string. The pointer is advanced to the start of the next character. Compare two UTF-8 strings, and return match (0) if passed in "key" value equals or is the prefix of the "node" value.